As I've said before, part of the delay has involved some strategizing about how to reboot this as a website feature while simultaneously developing it as a book or series of books, which I have already discussed with one excited editor who has given me some great leads. This part of the plan obviously means not giving away all the content for free. Still, the response to what I've written so far and what currently remains available on the site is why there is a documentable audience for such a publishing venture anyway. So the compromises here will be twofold: 1) updates and reboots, but rarely for full years, and requiring that portions of what's currently posted will have to come down; and 2) a focus at first on two particular decades, since these subsets of the larger project will serve as the sample material for prospective agents and presses. My current plans are to start with 1970-79 and 2000-2009, so expect the first wave of new and revised posts to fall within those frameworks. I hope you'll be excited about this material, and since your enthusiasm will be a huge help in making the case to publishers, please be vigorous in the Comment sections, even when you disagree with me! Meanwhile, turning from leading ladies to their supporting sisters, this year marks the 80th birthday of the Best Supporting Actress category at the Oscars, meaning we'll soon meet our 400th nominee. But here's a statistic I don't think you'll read anywhere else: because of multiple nominations from the same movies in many years, our existing constellation of Supporting Actress nominees hails from 360 movies. Barring the unlikely scenario whereby Rooney Mara's transfixing lead performance in Carol gets nominated in the Supporting race, as per studio wishes, and her castmate Sarah Paulson comes from behind to reap a surprising but well-deserved mention on the same list, we'll be looking at 365 movies over time that reaped recognition in this race. Did someone say 365? Who am I to ignore a number as resonant as that? Yes, I know, 2016 is a leap year. But that won't stop me from posting this handy calendar representing all the movies that have made that category such an enduring joy, if also an occasional head-scratcher or locus of frustration. When there's time, I'll post some occasional performance reviews here, too. One's up today for Beulah Bondi in The Gorgeous Hussy, the first name listed on the first ballot in the first year of Best Supporting Actress. And yes, it's 365 words long. Obviously, the Supporting Actress Smackdowns at Nathaniel R's The Film Experience, having originated at StinkyLulu's Blog, remain the best, most thorough, and most excitingly multi-voiced spots to investigate "actressing at the edges." I'll be less of a completist in this area and don't want to horn in on their turf. Though in fact, the idea of the Smackdowns was initially inspired by my own Best Actress section, so everything comes full circle! I'll look forward to more posts, conversations, and hopefully publications in 2016. No website can satisfy all your actressing needs, which I assume are substantial, and no new year ever goes exactly according to plan. But I'll keep showing up if you do. Cheers! 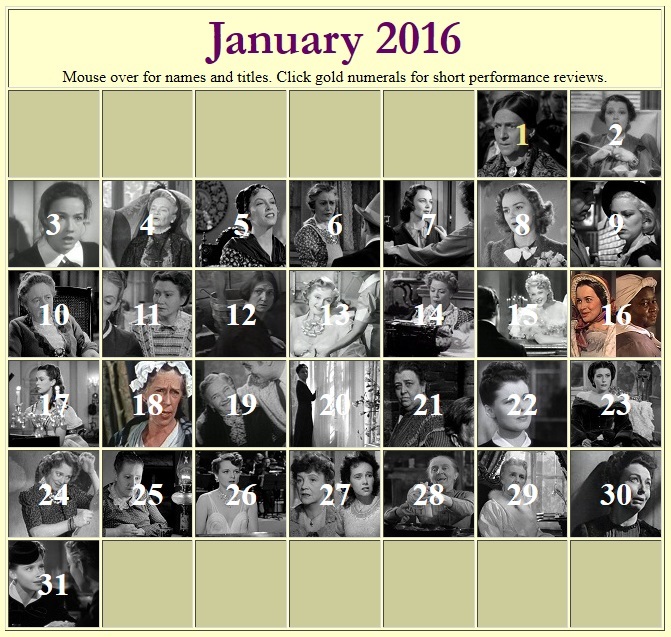 Will you be doing the same star ratings when you review the supporting actress performances ? I'd been waffling about that. I've added one here, but we'll see, moving forward. What an exciting start to the new year! Can't wait for all of this! - Where do I pre-order this book? - I would like - nay, need to purchase seventeen copies. Praise be to the heavens! The world needs to hear you opine about actressing with greater regularity. Will buy the eventual book for myself and gift copies to anyone I somewhat like. I din't get *exactly* what it is you'll do but what I got made me, of course, excited and grateful! Aside from Halle Berry's historic win I never understood the importance of the Best Actress category prior to being led to Nick's site after he initially completed the task of watching every Best Actress nominated performance ever. After complaining about his ranking of Kathy Bates' win he shared with me in an email how she's a similar actress to Annette Bening! Which means he's a total original in his sensibilities to connect things others would not. Very anxious about the revamped layout and the new write-ups. Thanks so much to all of you! And to /3rtful for the lovely and specific memory. I've already started watching some 2000 movies I haven't seen, or not in a while, which will now be folded into the project. Something should be up by the end of the month. I haven't seen Dead End (now I really want to) but I can kind of imagine Brannagh and Thompson in the scene you described. This is the best news! So excited about all of this, can't wait to read it. Glad you're lending your eye and words to Supporting. My boyfriend and I have been going ceremony-by-ceremony chronologically and been watching all lead and supporting actress nominees. We're in 1953 right now, so nice to revisit some of those early performances.